Posters from 45 Greek bands and solo artists printed on the emblematic dimension of 50x70 cm. Famous groups, newcomers or wannabes - silkscreens, offset or digital prints - from awarded graphic designers, small studios or do it yourself. The result forms a rare collection of images from live performances that create the imagery of the modern Greek music scene. 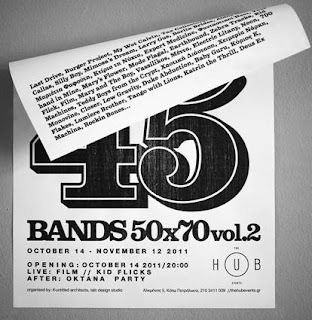 The show is an attempt to collect and exhibit the creative identities of various bands from different music genres in one space simultaneously. The concept? 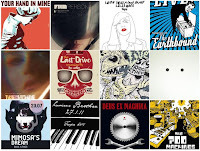 Music bands that experiment with their image either through do it yourself posters or through collaborations with artists and design studios, therefore creating a unique relationship with their fans. During the exhibition opening there will be live performances by Kid Flicks and Film and an OKTANA party with dj’s by the legendary Exarchia club. Personally, I will be participating with 2 posters made for Chimeria Narki and Chaotiki Diastasi. Deus Ex Machina - 38 Xiliosta / Bastardokratia 7"